Violence was reported from across Gujarat on 24 August evening following the brief detention of Patidar Anamat Andolan Samiti (PAAS) convener Hardik Patel and police crackdown on his supporters at the rally venue in Ahmedabad, Gujarat. After the police detained him, three police pickets were set ablaze, and the residences of state ministers Rajnikant Patel, Nitin Patel as well as BJP MLA Jayshree Patel were attacked in Mehsana. 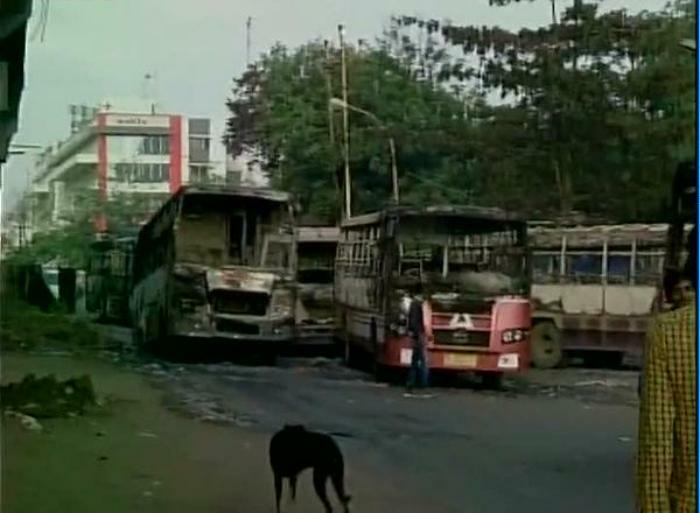 Following the violence curfew has been imposed in Mehsana district and Surat. All schools in Ahmedabad have been declared shut on 25 August till further orders. Hardik Patel has also called for Gujarat Bandh today. Following his appeal security has been beefed up in the state. How did the protest turn violent? The trouble began soon after the rally, when Hardik proceeded to sit on a hunger strike. Police said the protesters only had permission to hold a rally at the GMDC ground till 5 pm, and asked them to vacate the place. When the crowd resisted, police resorted to lathicharge to disperse them. Following lathicharge dozens of people sustained injuries. Agitated protestors reportedly blocked roads including the Vadodara-Ahmedabad expressway, resulting in a traffic jam that stretched for over 10 kilometres. The angry agitators also attacked the BJP's headquarters in Patan, the collector's office in Gandhinagar was stoned, and incidents of bus burning and chakka jams were reported from Ahmedabad, Rajkot, Surat, Gandhinagar, Mehsana and Vadodara. 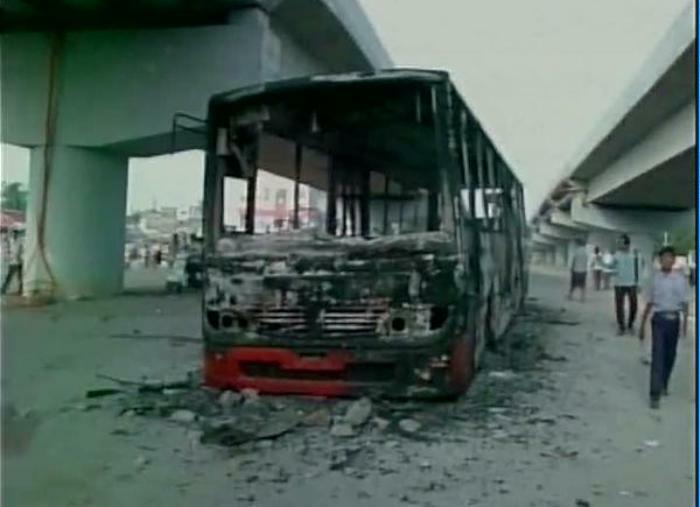 Mobs torched a public bus in Bhuyangdev area, pelted a fire brigade team with stones and vandalised a BRTS bus at Gota. 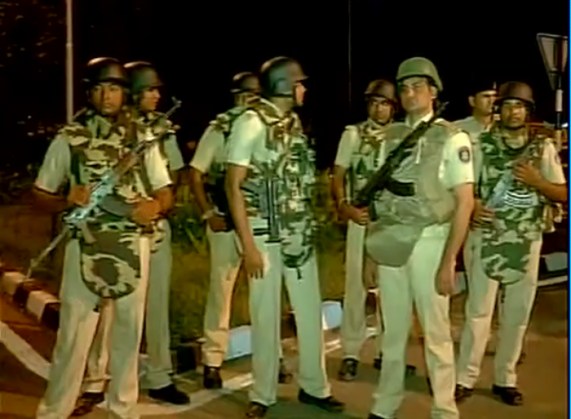 There were reports of clashes between protestors and the police in Pandesara, Surat. 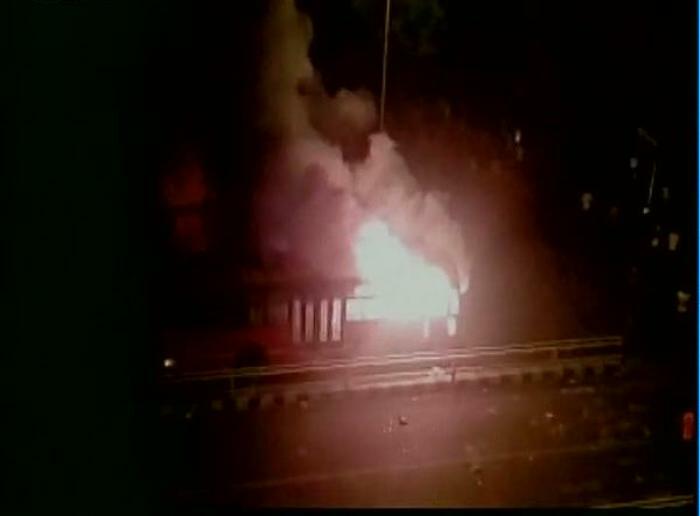 Two BRTS buses were set ablaze in Rajkot and traffic was blocked near Khijadiya bypass on Rajkot-Jamnagar road and Jamnagar-Lalpur road. Chief Minister Anandiben Patel has sent an appeal for peace. She has also ordered a probe for finding out why did the police lathicharge at the protestors. She also said "Don't destroy government properties as they are public property too." Internet services on mobile phones have been suspended in Gujarat so that social media isn't used for spreading rumours that can lead to more violence. Union Home Minister Rajnath Singh took to twitter and wrote "Additional paramilitary forces have been rushed to Gujarat as per the request made by the state government."